In the US, December 7 is Pearl Harbor Day. Pearl Harbor Day was established to remember and honor the 2,403 citizens of the United States who were killed in the Japanese surprise attack on Pearl Harbor in Hawaii on December 7, 1941. The attack catapulted the United States into World War II, with President Roosevelt declaring war on Japan, calling December 7, 1941 “a date which will live in infamy.” As the years pass, fewer people are alive who remember the day from personal memory. Pearl Harbor Day is not just a vague day of remembrance for me. My father was a World War II veteran, having served in the US Navy near the end of the war. He was not in the service when the war started, nor in 1941. Like many other young men of his day, he volunteered when he was old enough to do so. Why he picked the Navy, I don’t entirely remember. He got seasick and he couldn’t swim. He had to communicate in semaphore, which he laughingly told me he could never master during his brief stint in the Boy Scouts. When the war was over, he left the service, tried out a couple of colleges, and then worked for others until he struck out on his own as a business owner in San Francisco. Where would my father have ended up if he hadn’t been in the service? Not sure. I think he had already dropped out of high school. I don’t think he could have afforded even the little bit of college he attended if it hadn’t been for the G.I. Bill. He was a child of the Great Depression and a bit of a rebel kid, from his telling of it years later. He never considered himself to be a member of any sort of “Greatest Generation.” As I mentioned before, Dad said he felt that every generation rises up to the challenges of its day. Some though, you would have to acknowledge, have had far graver challenges than others. When I was living on Maui, my sister and her family would come to visit. During one visit, we all spent a few days on Oahu. My sister, Mike, and I went to Pearl Harbor, and we went out by boat to the USS Arizona Memorial. It was an incredibly moving experience for me. I’d have to look back at my old blog entry (if I still have it) for more details, but I remember feeling less sad than I thought I would but also completely in awe of the magnitude of the events of that day. And still very sad for the Navy service members who lost their lives aboard the USS Arizona. And throughout Pearl Harbor. Hearing and reading about it don’t generate the feelings that come when you stand above the wreckage of a sunken ship somewhat frozen in time. Or see the wall of names of those who died. I’m grateful I had the experience to visit the memorials and exhibits in person. As more and more years past, fewer and fewer visitors will have had stories of World War II told to them in person by someone with firsthand knowledge. As it is, those of us with “Greatest Generation” parents and grandparents probably didn’t hear a lot of stories to begin with. It seems to be a shared trait of many WWII veterans to have rarely shared stories of their service. When my father halted his cancer treatments over 10 years ago, I realized I had no idea where he had traveled during his Navy career. I went out, bought a large paper world map, grabbed some pens, and put the map in front of my dad. I told him, “Now you show me where you went, where you stopped, how did you end up with those carvings you said you got in Africa?” I’m glad I had the chance to do that too. There’s a big chunk of collective history we are losing year after year. And with that, I’ll post a few pictures from my trip to the USS Arizona Memorial. It’s been over 10 years since I was there, so I don’t know how much its operations have changed. I think it was shut down for a while. I hope there are still opportunities for others to visit it. On a lighter note, December 7 also happens to be my parent’s wedding anniversary. And this year would have been their 50th, if my father was still alive. There’s a whole other set of stories about their meeting, and marriage, and wedding day. Mom loves to tell people a few particulars about the day. Maybe I’ll share that on a separate blog. Happy Anniversary, Mom and Dad. I miss being able to get a flower lei everywhere. On Maui you can buy a fresh flower lei almost everywhere. Whenever I would pick someone up at the airport for a visit, I would stop first to buy a lei to greet him/her/them. You can buy them at any Safeway store or, better yet, get a two-pack of purple orchid lei or a fancy tuberose lei at Costco. 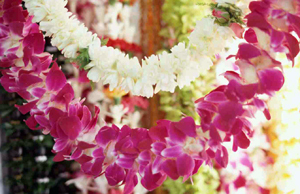 Leis are a simple yet elegant way of recognizing someone special. I miss them. I miss being able to run to the grocery store and picking up a lei to share. I miss giving them away. I miss having them in the house. I think this topic will be a continuing series here as I re-adjust to life in California. You didn’t know I’m moving back to California? eh? Oh – go see my entry about all the poor blogs stuck in draft. I’ll try and finish the one that explains what I’ve been doing since the end of February. It hasn’t run since 2004, but this morning the waves at Waimea Bay are HUGE. The tournament director made the call this morning – The Eddie is on! The first 7-man heat started 10 minutes ago (8:00 a.m. Hawai’i time). The live webcast is pretty good. Good commentators. Good replays. And incredible coverage of the awesome sets. Wow wow wow! December 7 – Pearl Harbor Remembrance Day for folks here in the US – may have more meaning for me than for other people. For one thing, I now live in Hawai’i and nowhere are the events of December 7 1941 more remembered than at Pearl Harbor itself. The attack on that day targeted not only the harbor with the US Navy ships, but also Hickham, Wheeler, and Bellows Army air fields, Ewa Marine Corps Air Station, and Kaneohe Naval Air Station. It is now 2009 and there are still people living on Oahu who remember the attacks from 1941. There are also still a very few veterans of World War II in the area. Fewer and fewer every year, but some are still around. Another reason I always remember this day on my calendar is because it is/was also my parents’ wedding anniversary. Happy Anniversary! And finally, speaking of those World War II vets, my father was one. He would have been 83 years old this year. He was a Navy man and, although he rarely talked about it, he was fiercely proud of his service during the war. He was one of those young guys going along with his life when the US entered the war. He and his brothers signed up and shipped off to various parts of the earth. Dad in particular went to many places as he ended up on a supply ship and circumnavigated the world at least twice. He left the service after WWII, and he really never accepted the term “Greatest Generation.” Dad always felt that every generation rises up to the challenges that it faces. 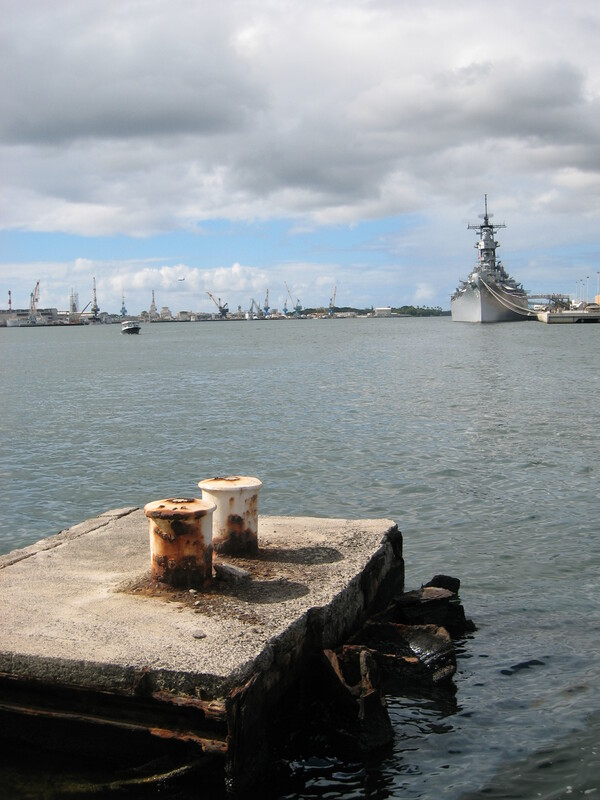 My Big Sis and I visited Pearl Harbor a couple of years ago when she was here visiting. We went out to the USS Arizona memorial. Later, Sweetie and I also visited the USS Missouri. It was a moving and educational experience. I thought I would be overcome with emotion when I got out to the USS Arizona memorial, thinking about my father and the Navy men and service-people and American civilians who died on December 7, 1941. I’m not generally a loud flag-waving rah-rah type. But I felt more awe than sadness while gazing out at the water in the Harbor. I could write something cliche about those who are doomed to repeat the past if they don’t remember it. But I think many people do remember past wars. We remember why they came about. We remember how they were fought and the cost of fighting them. And then tomorrow dawns with a whole new set of world events and circumstances and there is never a guarantee that we won’t fight again. I haven’t figured out how to prevent that from happening yet but I’ll let you know if I do someday. The USS Arizona tour is free. You arrive, get a card for admission to the excellent 20+ minute movie, and board a boat that takes you out to the USS Arizona memorial in the harbor. The loss of life on the USS Arizona on Sunday, December 7, 1941 was 1,177 lives. Overall, more than 2,000 lives were lost at Pearl Harbor that morning. After being struck by airborne torpedoes, which ended up hitting the ammunition magazine section of the battleship, the USS Arizona battleship sunk in less than nine minutes. 66 years after the explosion that destroyed Arizona, oil leaks from the hull still rise to the surface of the water. The USS Arizona continues to leak about a quart of oil per day into the harbor. Survivors from the crew say that the oil will continue to leak until the last survivor dies. The attack on Pearl Harbor sunk, beached (the USS Nevada captain ran his ship aground so it would not block the harbor entrance as it sank), or damaged 21 ships in the harbor. Of the 21 ships, including eight battleships, that were damaged during the attack, all but three were returned salvaged, returned to service and later saw action. The restored ships included the USS California, USS Maryland, and the USS Pennsylvania. 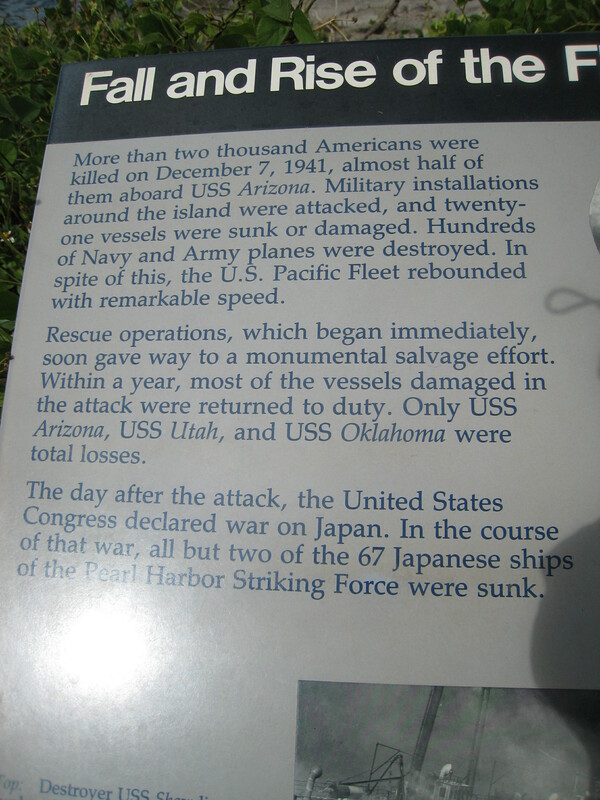 The USS Utah, Arizona, and Oklahoma were total losses. The damaged USS Tennessee was restored within two weeks. The USS West Virginia was raised, repaired and returned to duty in 1944. She later won five battle stars and was present in Tokyo Bay in 1945 to witness the Japanese surrender. According to the “Casualties of World War II” chart on board the USS Missouri, there were 19 million military deaths and 50 million civilian deaths during WW II. The civilian deaths included 15,000,000 in China and 20,000,00 in the Soviet Union and 5,600,000 in Poland. Staggering losses of civilian life. The National Weather Service is warning of “giant” surf headed for the islands, prompting civil defense officials to caution people in coastal areas to take precautions. A set of very powerful storms in the north Pacific will produce two northwest swells over the coming week, according to the weather service. The first swell was expected to arrive Friday night and peak today, bringing 20- to 30-foot surf with 40-foot sets on outer reefs. A second and larger swell was forecast to arrive Sunday night, with surf building rapidly to 30 to 40 feet, with sets up to 50 feet on outer reefs early Monday through Tuesday night. Surf is expected to remain above warning levels through Wednesday. 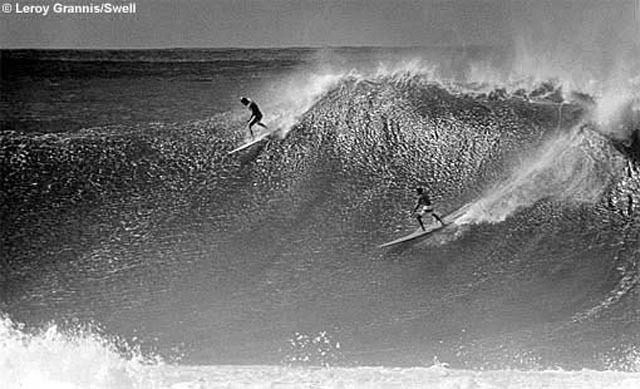 That’s Eddie Aikau size ladies and gents! I blogged last year about the Quicksilver Invitational in memory of Eddie Aikau over on Oahu. The holding period just started for this season and now we have alerts for some super high surf. They haven’t run the Eddie since 2004, but this may be the year folks! I don’t know why I get so excited about it. I’m not a surfer. Although – I still want to take at least one or two lessons while I am living on the island. I think it’s pretty intimidating to have a surf invitational event that isn’t even held if the waves don’t get big enough. Makes it pretty intense when it runs. I’d love to be on the North Shore to see it live but it’s fun enough for me to watch our local newscasters report. As for Maui, maybe I’ll have to run out to the Hookipa Lookout spot and see if any local surfers would dare to brave the waves. I don’t think our surfing spots are as consistent as Oahu’s North Shore, but it’s still fun to watch. Eddie Aikau site is over HERE.